What are the best free online portfolio websites for you to display UX/UI design works and show off your design skills and capabilities? 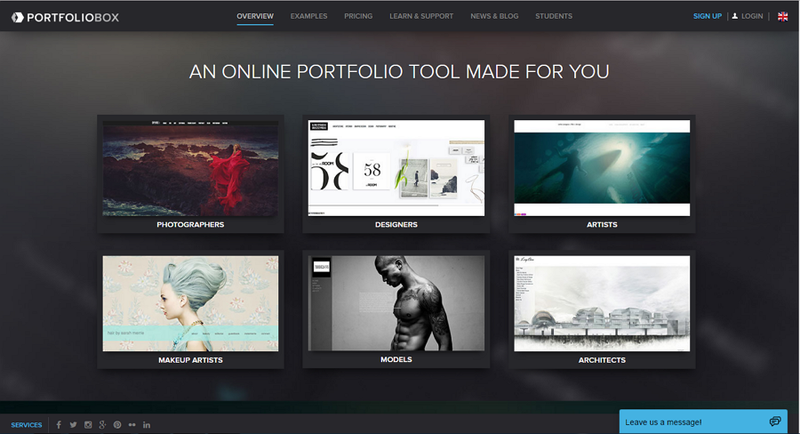 Here are 10 best free online portfolio sites for you. As one of the most widely-used free online portfolio websites in the designer communities, Behance not only attracts millions of UX/UI designers, artists and photographers around the world to continuously upload their excellent design works for building cool personal design portfolios each year, but also appeals to many interviewers, recruiters and hiring managers for browsing these designer portfolios and looking for new talents. So, in this aspect, Behance is definitely one of the must-have online portfolio websites for you to display your designs and land a good UX/UI design job over the internet. *Free sign up and create your own profile with personal information, including contact and social media information, etc. *Free upload and edit your UX/UI design cases/photos easily with its advanced file editing tools. *Free add multiple owners to a collaborative design project. *Quickly interact with site visitors and get feedback by reading their site comments. *Quickly search and discover latest UX/UI designs for your inspiration. *As an all-in-one portfolio site, it also allows you to search and browse good UX/UI design jobs posted by trustworthy companies or employers from different countries and regions. In short, as a free online portfolio website that can help designers display various design works in details, Behance is often used by designers to showcase the latest design works/concepts and search for feedback and suggestions from other designers/clients as well as sharing free design kits. Of course, it will also be a good place for you to create a unique portfolio site. 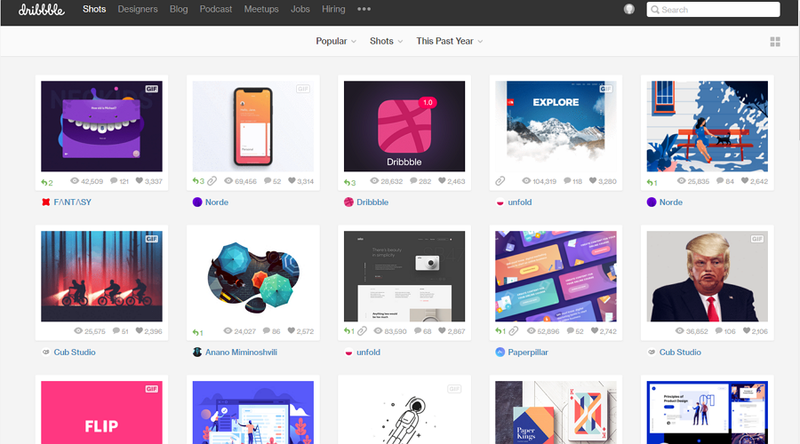 As an online site that is quite similar to Behance, Dribbble is also another popular free online portfolio website among UX/UI designers. You can easily create a free account and share small screenshots of your designing processes, design drafts, interactive prototypes, app design concepts, and more designs. Moreover, as an online site specially made for designers to present different design projects in the very beginning, Dribbble is also a good platform for designers to display new design works, improve design skills, share and communicate design ideas. *Free register and create your own profile. *Free showcase photos of different design works, processes and current projects. *Free search and follow outstanding designers for communicating design ideas. *The Dribbble Meetups block allows users to join various designer communities and activities. *Check and browse the latest UX/UI designer positions there. *The Blog section offers a nice place for designers to share the latest designs, ideas, and experiences. And unlike Behance that can present design cases with super details, Dribbble only allows users to display screenshots of different design works. So, in order to attract more employers and recruiters, designers often use Behance and Dribbble together. For example, firstly upload a group of high-quality and eye-catching design screenshots for arousing interests of site visitors, and then leave a Behance link with design work details for encouraging them to keep on reading. This will be far more effective than using Dribbble alone. In short, as an online portfolio site that features for showing beautiful design photos, it is also a good choice for you to create perfect portfolios online. Coroflot is also a good worldwide online portfolio website for UX/UI designers though it is not as powerful and famous as Behance and Dribbble. With over 2 million images for over 150,000 creatives published from different designers, artists and photographers every month, Coroflot becomes one of the most professional online portfolio sites. Its well-integrated job board (which is "the largest and most active platform specifically targeted for the hiring needs of companies") is also really worth trying, if you are coincidentally applying for good UX/UI design positions on the web. *Free join and create your own profile with work samples, work and education history, and more personal information. Always pay much attention to uploading three best work samples that can best represent your design skills and industry experiences. *The Design Job section enables designers to quickly search for desired UX/UI design positions with different key words. *Check average designer salaries in different locations. 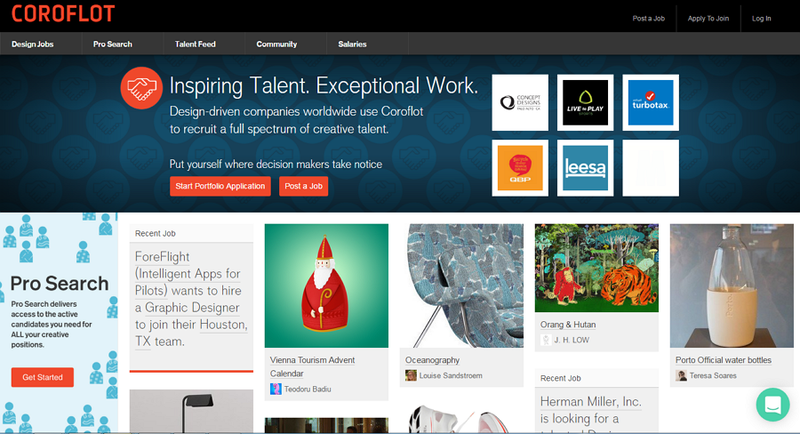 *Search and view talented designs easily. In short, if you create an online portfolio site for applying for a UX/UI design job, this website could be nice for you. 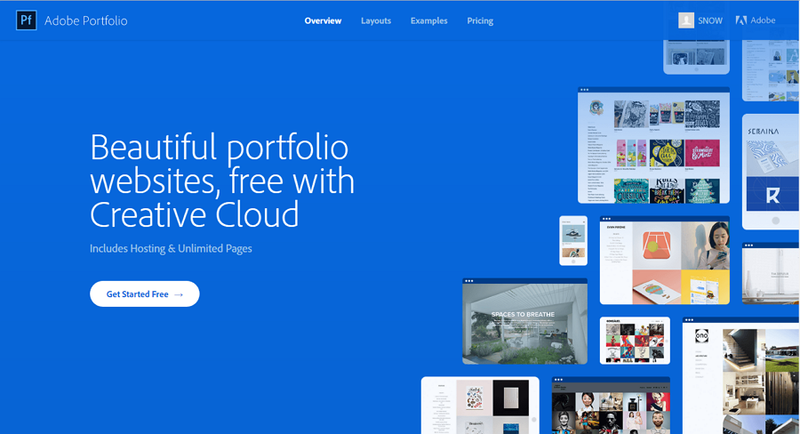 As one of the free tools included in paid Adobe Creative Cloud plans, Adobe Portfolio enables designers to quickly create beautiful and high-quality personal portfolio sites in minutes. It also offers users a free Creative Cloud subscription service. And since Adobe is one of the sponsors of Behance, Adobe Portfolio allows designers to syn design updates to Behance for free. *Pick/customize a layout to present your best UX/UI design works more beautifully and creatively. *Import design projects at Behance easily. 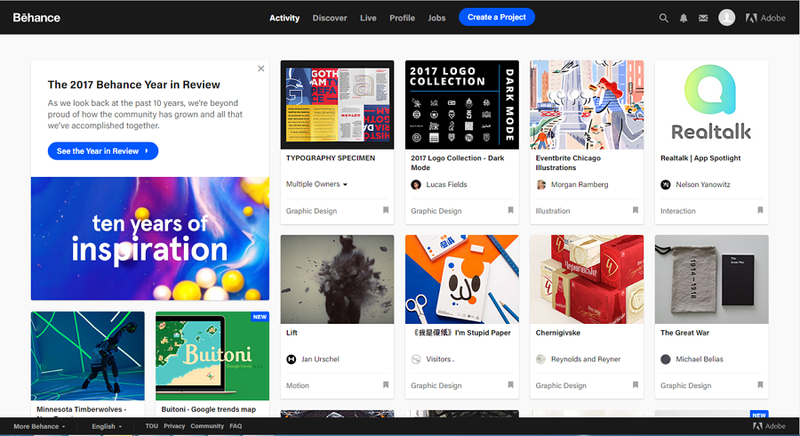 *Synchronize the latest Adobe Portfolio design works to Behance easily and quickly. *Get free access to the full Typekit font library, if necessary. 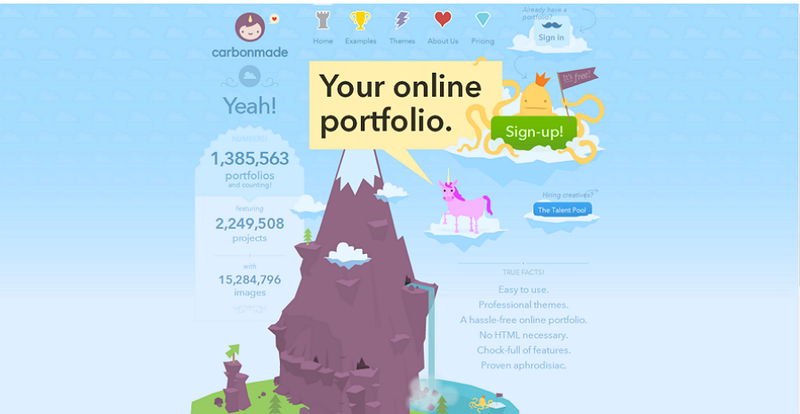 With over 15 million images and 1 million portfolios, Carbonmade is an easy-to-use and hassle-free online portfolio site. It offers beautiful visual-based themes and unique domain name services. And, as a tool originally used to make life easier for designer fellows, Carbonmade is much better for UX/UI designers who want to meet more talented designers, share design works and communicate with them there. Moreover, it also features for its simple and easy-to-use interface. *Get customer support and project archiving services. *Allow you to upload SD videos and audios. 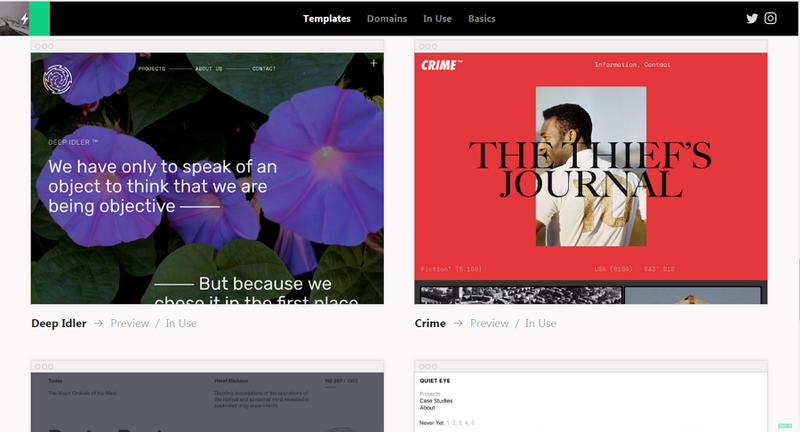 *Get a bunch of gorgeous portfolio themes. So, if you want to be able to build an online portfolio with ease and fast speed, this simple and fast Carbonmade would be a good try. Cargo is also a simple and effective online portfolio site that allows designers to create freestanding personal websites with a series of pages and their own URLs. Unlike common free online portfolio websites that typically allow designers to easily register to create an account, Cargo needs designers to be invited to join. Moreover, it is popular with UX/UI designers for offering a variety of diversified well-designed portfolio templates. *Its free basic service offers 12 projects and 3 pages for free. *Provide 40 portfolio design templates for designers. *Allow users to build an online portfolio site with their own domain names. *Get a selection of typography from Webtype, Type Network and Google Fonts, etc. In a word, Cargo is more suitable for designers who want to freely choose well-designed portfolio templates and create their own portfolios more quickly and effectively. 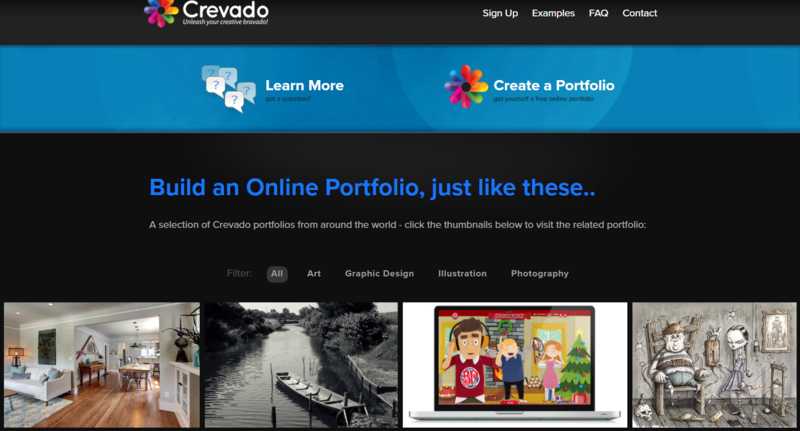 Crevado is also a free and easy online portfolio builder that enables designers to create online portfolio sites and showcase their UX/UI design works on the web. It allows users to customize their sites and upload design files with different formats, like photos, videos, GIF images, PDF and more formats. Moreover, as a responsive portfolio site, it is also accessible from most electronic devices, including a desktop computer, laptop, tablet and mobile phone, etc. In addition, since it supports easy and fast online payment through PayPal and Fotomoto, it is also very easy for designers to sell their design works online. *Free register for a basic account with 30 images and 5 galleries. *Offer a free trial plan (up to 14 days) for designers to see whether it is worth paying. *Sell your design works through PayPal and Fotomoto, if you do have paid for a premium account. So, if you are a UX/UI design freelancer and planning to sell your portfolio works online, you can just give it a try. PortfolioBox is a simple online portfolio made for creative designers and allows them to create a truly unique portfolio website by using any style for any page. And it also enables users to manage galleries, e-commerce, blogs and much more services. Moreover, It also offers a free domain name service for your portfolio site. *Offer a variety of language services, like English, Chinese, Japanese and French, etc. *Offers two type of accounts: a Free account and a Premium account that needs to be paid. *Its Free account allows users to host 10 projects, 30 images and 10 pages for free. *Its all pro-templates will be unlocked free for 30 days, if you are using a free account. *Offer a free domain name service for your site. Therefore, if you are planning to use no any standard templates and design your portfolio sites on your own, this site would be perfect. Portfoliopen is a user-friendly online portfolio site that allows designers to create a professional looking portfolio in minutes without coding. It enables you to choose well-designed themes to create a professional design portfolio site. Moreover, with up to 3GB of online storage space, you can also freely upload your design works and images as you wish. And you can also quickly get feedback and suggestions by reading comments from different site visitors. *Its Free account allows designers to upload 10 design works for free and has 10 MB of free online storage space. *Support site visitor rating and commenting. 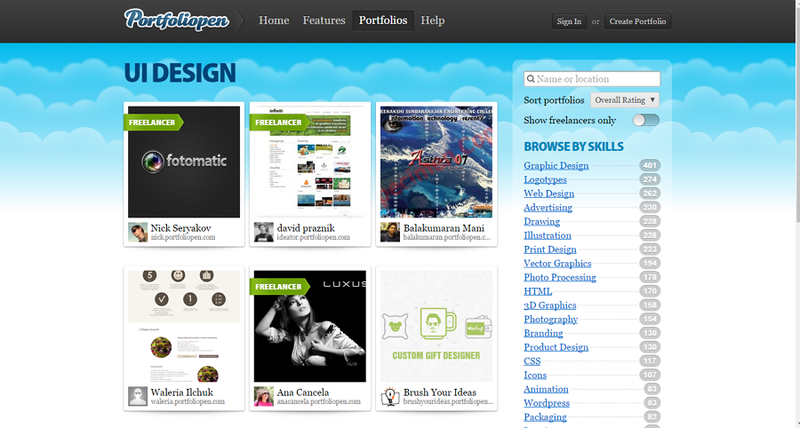 *The top rated design works and portfolios can be listed on its Home page for free. Overall, if you want to get more storage space for freely uploading more design cases, files and photos, Portfoliopen can easily meet your needs. 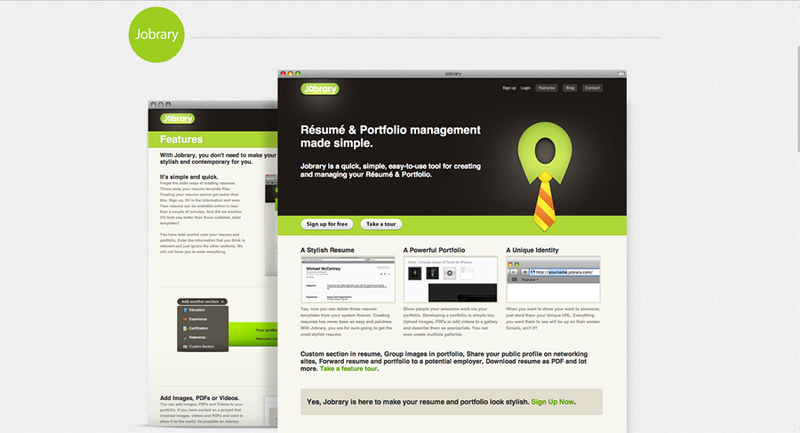 Jobrary is a simple online website that allows users to create both an online resume and portfolio site. And while trying to edit a personal portfolio site, you are allowed to add images, PDF files and videos to showcase your design work. It also offers users a unique portfolio URL. Moreover, it also supports sharing both of their resumes and portfolio sites on different networking sites with simple clicks. So, if you want to build both of your resume and portfolio on the same site and edit, browser, share and print them more conveniently, Jobrary would be an ideal choice. Above all are our top 10 best free online portfolio websites for you to create perfect UX/UI portfolios on the web. And in order to increase the chances of getting noticed by potential clients/recruiters, you’d better also use and create two, three or more portfolio sites with different styles and characters together.